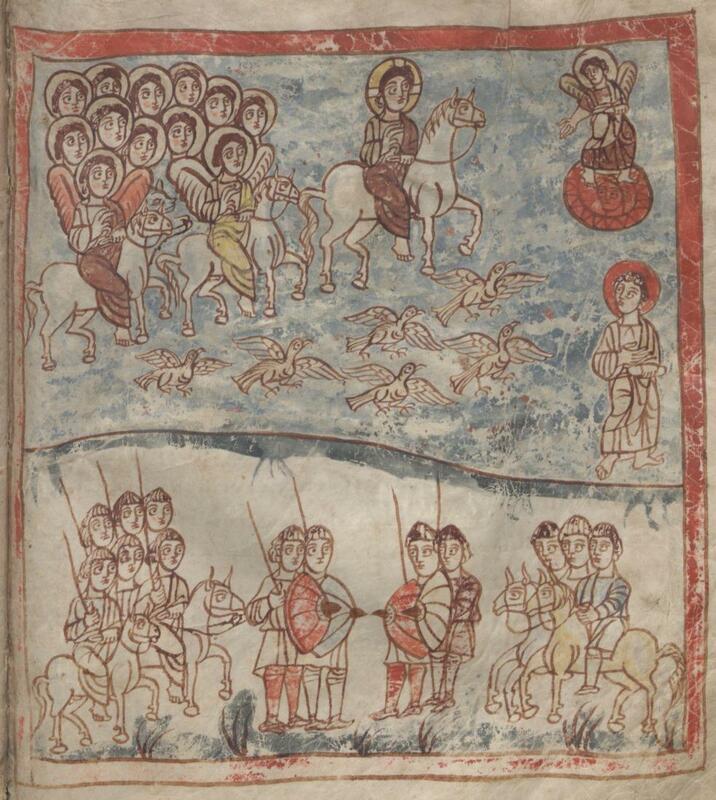 'Trier Apocalypse', Carolingian, Tours, France, 1st quarter 9th century. Folio 63, Stadtbibliothek Trier Cod. 31. A larger image of Trier Apocalypse, folio 63, Stadtbibliothek Trier Cod. 31. Special features: Contains the Apocalypse of the New Testament. (so-called Trier Apocalypse) The script indicates in the circle of Tours. On each page a full-page, mostly coloured miniature. Pen and ink drawings, partly damaged, on folio 74v and after-page I. Script of several hands of the 9th century. Simple red and black initials. Back to the Trier Apocalypse, Carolingian, Tours, France. Stadtbibliothek Cod. 31.